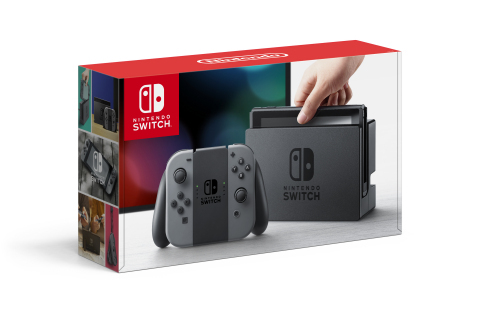 Nintendo Switch Becomes the Fastest-Selling Home Video Game System of All Time in the U.S.
REDMOND, Wash.--(BUSINESS WIRE)--Nintendo Switch has become the fastest-selling home video game system in U.S. history. The home console that players can take wherever they go launched March 3, 2017, and in 10 months has sold more than 4.8 million units in the United States, according to Nintendo’s internal sales figures. That’s the highest total for the first 10 months of any home video game system in U.S. history, surpassing Nintendo’s own Wii system, which was the previous record holder with more than 4 million units sold during the same timeframe. A strong library of games continues to fuel momentum for Nintendo Switch. In the U.S., more than 60 percent of Nintendo Switch owners have Super Mario Odyssey, and over 55 percent own The Legend of Zelda: Breath of the Wild. Not only are these games system-sellers, but they’re also two of the highest-rated games in history. Nintendo Switch owners also possess the fun, competitive games Mario Kart 8 Deluxe and Splatoon 2 at rates of more than 50 percent and 20 percent, respectively. More than 300 games created by third-party developers have already launched for Nintendo Switch. These include big-name brands like FIFA 18 from Electronic Arts, Mario + Rabbids Kingdom Battle and Just Dance 2018 from Ubisoft, Minecraft: Nintendo Switch Edition from Mojang, L.A. Noire from Rockstar Games, NBA 2K18 from 2K Games, Sonic Mania from SEGA, Ultra Street Fighter II: The Final Challengers from Capcom, Rocket League from Psyonix and The Elder Scrolls V: Skyrim and DOOM from Bethesda. Nintendo Switch has also received strong support from indie developers, with a steady stream of favorites like SteamWorld Dig 2 from Image & Form, Golf Story from Sidebar Games, Overcooked Special Edition from Team17 Digital Ltd and Stardew Valley from Chucklefish LTD. This year, Nintendo Switch owners can look forward to Nintendo-published games like Kirby Star Allies, Bayonetta, Bayonetta 2 and a new game starring Yoshi. Fans can also expect continued support from major publishers such as EA, Activision, Ubisoft, Capcom, SEGA, Take 2 and Bethesda, plus a growing catalog of quality content from indie developers.